I am finally getting closer to finish the whole Army... this is he last unit I need to paint. I have 15 Reavers with Jump Packs, and I painted them in blocks of 5 each. 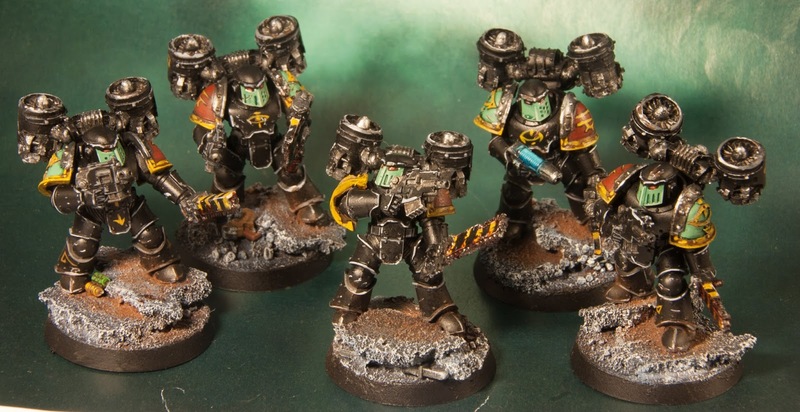 I decided to paint them black as Reavers because they look cool even though sometimes I have field them as regular marines. Some of them are magnetized to exchange weapons, and some are not. I was too tired at this stage of the Army to keep on magnetizing everything, and I found out, I usually stick to the same weapons anyway. I can always go back and magnetize some parts if I need to. The base cost of 5 reavers with Jump Packs is 185 points.